Update: Erica Barnett at The C is for Crank has a rundown of what Councilmember Sawant’s proposed ordinance would do (putting severe restrictions on a lot more property than the Showbox) and rapid timeline for approval. 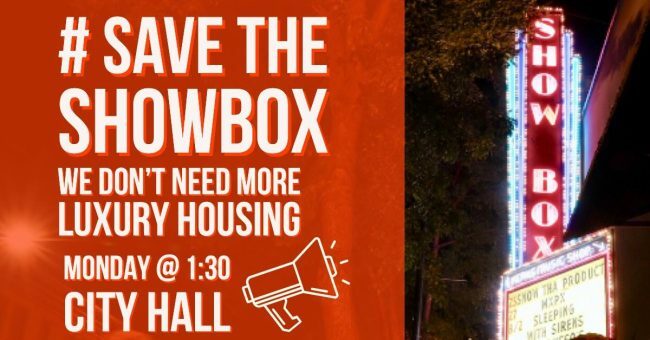 The movement to save the Showbox has grown quickly, and attracted some wanting an opportunity to proverbially punch a developer in the face, or to stop more housing from being built, for which the Showbox has provided a convenient excuse. There is no actual item related to the Showbox on today’s 2:00 City Council Agenda yet. There are, however, ordinances proposed by Councilmember Mike O’Brien on the introductions calendar to get all for-profit employers with over 20 employees in the City to offer pre-tax commuter benefits beyond car-cost reimbursements, and to provide guiding principles on reorganizing the Move Seattle bond Levy package. Much of today’s affordable housing was once someone’s “luxury housing”. Some of the largest shelters downtown, such as the Morrison Hotel and the Bus(c)h Motel were once state-of-the-art luxury housing. The apartment complex where I live looks very much like it was once a hotel. A lot of the “naturally affordable housing” targeted for purchase by the City is older single-family homes. In short, there is a lot of truth to the adage that today’s luxury housing is tomorrow’s affordable housing. The Showbox is a victim, not of crass developer capitalism, but of our failure to recognize the housing supply problem before it became a crisis. Josh Feit has a lot more to say on the topic, over at The C Is For Crank. I would just add that having a performance space of similar quality to the Showbox can happen on-site, most likely on the top floor. Lift the height limit in exchange for building such a performance space, and more income-limited units. Then, everyone should be happy except the historic preservationists, housing opponents, and height opponents. Having lived in Seattle in the past, I couldn’t place the Showbox. So, I Google Mapped it. That’s kind of an ugly building. Yes, please negotiate with the developer to build new, and better, performance space in the building. Raising the height limit would be one way of accomplishing this. I’m sure there are other ways, as well. Lots of other music venues that have hosted huge entertainment acts have also seen the wrecking ball, or should see the wrecking ball. Among them: Riverfront Stadium, the Astrodome, Tiger Stadium, Yankee Stadium, the Kingdome, and dozens of other big-league stadiums and probably hundreds of small-time arenas and amphitheaters like Hara Arena and Cincinnati Gardens. The fact that famous people performed there doesn’t make it historic or worth saving. The need for a performing arts space should be recognized and built in to redevelopment, but that doesn’t mean saving an old building with dated electrical systems, poor insulation, and even worse land use. Having some redeeming artistic quality in the building itself, such as the Moore or Paramount, would make a much stronger argument for preservation, which the Showbox simply does not have. Despite the building not having as much historic value, I can almost guarantee Seattleites feel more connection to the Showbox than to the Moore or Paramount (or any other venue). The Showbox is the quintessential venue in Seattle for seeing live music, in terms of the layout, the accoustics, and the vibe. And yes, the history and culture associated with it is tremendous. I’m all for building more housing on this site specifically, but I think it has to be done in a way that preserves the Showbox. Whether that means reinforcing the existing structure and building on top of it or keeping the facade and building a ground floor venue that mimics the Showbox. And yes, let the developers build taller in exchange for that so it pencils out. The true villain here is our ridiculous exclusionary, suburban zoning outside of the Downtown core. This is supposed to be a city, yet most of it looks like a suburb. If zoning laws were relaxed (and I’m talking beyond current MHA proposals) there would be no need to tear down the Showbox. But since that’s not the case, we have to find a compromise and I think one is available. Agree on all counts except for Seattle’s “connection” to various venues. A LOT of Cincinnatians held a very strong connection to Riverfront Stadium. It was THE venue for every sporting event for 32 years, including the decade of the Big Red Machine where the beloved Reds won 6 NL west titles, 4 NL pennants, and 2 World Series’ titles, where Hank Aaron was the first to hit a home run in the stadium, and where Pete Rose broke Ty Cobb’s MLB record, all in a city where opening day of baseball is historically a holiday from school and occasion to take off work or school to watch the parade AND the game. I grew up a few hours away from Cincinnati, and our teachers would play the game on the radio for us. Riverfront was imploded in 2002 and replaced with a smaller but better baseball stadium with no bad seats. Yes, you can demolish something that locals hold near and dear. As with Riverfront, somebody needs to build a better replacement. How about relaxed zoning for this developer to go higher and denser, in exchange for a music venue on the ground floor with state of the art acoustics, and maybe soundproofing for the residents above? >> I can almost guarantee Seattleites feel more connection to the Showbox than to the Moore or Paramount (or any other venue). I disagree. Maybe it is a generational thing, but when I’ve asked around it was the opposite. I have good friends who are musicians and are really into music of various types, and the Showbox was nothing special to them. In contrast, they all remember seeing someone at the Paramount (even if it wasn’t always a great venue for shows). I feel the same way. Eventually it all becomes a blur, and you have trouble remembering where that concert was (“I think it was the old Seattle Center arena”, etc.) but you remember the Paramount, just because it is such a cool building. Well I can definitely place the Showbox because I’ve been to countless concerts there. I can tell you don’t have any memories of the place which means your view is that of an outsider in a sense. As a native I can tell you it is by far the venue I’ve seen the best shows at. I can’t think of anything else that compares for the kind of concerts I enjoy. That said I wouldn’t mind if they found some way to preserve it but I’m skeptical of how that will work out. Just putting it on the roof like the writer suggests seems like a flawed approach that just won’t work out as planned. I think it’s interesting as well that everyone seems to say the problem for the Showbox is that it’s one story. No that’s not the issue, the issue is that it’s one story but doesn’t have the support around it as much as other places. Nobody’s saying tear down Pike Place Market because it’s one story, so the idea that the height is the sole issue here is just bogus. It’s only part of the picture at least. Okay, how about on the first floor, like New York’s landmark Radio City Music Hall? Build a larger building behind the facade if necessary. Keep the happy/sad masks. I thought I heard on the radio this morning that Sawant would introduce a measure to designate the Showbox as historic. There’s some irony there because I thought Sawant’s priority was her working-class constituents, not dubiously-historic buildings. Barman may know a lot about music venues, but does he know much about housing? Housing is a basic necessity and there’s a severe shortage of it. You could say the city’s first priority should be ensuring everybody has housing. For me it’s less about nostalgia or anything particularly special about the Showbox and more about the need for performance space. Yes housing is a basic necessity, everyone who reads this blog is well aware of that. We could solve our housing crisis tomorrow by bulldozing anything deemed unnecessary for basic survival and building housing but that wouldn’t make for a very interesting place to live. I don’t know if the Showbox is worth saving but I do know once it’s gone it’ll never come back. I wish it made economic sense for a developer to build venues but you know as much as I do what the retail space will hold: an unstaffed Chase Bank and a Walgreens. barman hasn’t seen the first floor of the newest apartment buildings next to the train stations. the buildings north of Columbia City Station house a community center and several family-owned restaurants. Plaza Roberto Maestas, north of Beacon Hill Station, has a ballroom, a cafe, a credit union (which is better than an evil bank), and an open-air community space in the middle that hosts lots of celebrations. The tired old troll that first-floor retail is boring makes no sense when what NIMBYs are really asking is that no housing be built at all. Apparently the Elbphilharmonie is built upon an old warehouse that has residential and commercial units (restaurants as well as apartments). https://en.wikipedia.org/wiki/Elbphilharmonie. Seoul has a giant skyscraper with a concert hall in it, but I’m not sure what floor the concert hall is on (https://www.bloomberg.com/news/photo-essays/2017-04-03/seoul-s-lotte-world-tower-opens-with-highest-observation-deck). But in general concert halls inhabit the lower floors (like in Tokyo — https://en.wikipedia.org/wiki/New_National_Theatre_Tokyo). I would imagine this is because people would generally pay a premium to live someplace with grand views, but less to go to a concert there. I think it is more common to have a swanky observation deck (with maybe a small club or piano bar) instead of a big hall up in the sky. The other reason is that halls are often wider than the upper floors. Skyscraper often taper, or have a big block below, and a tower up above (the Tokyo building looks like that). I think that would be very sensible approach. Allow the developer to build a few stories higher, build a new, safer, hall at the base with a big tower above. You can then keep the marquee, and as Brent said, just about everyone would be happy. Sorry, that comment was in response to the earlier comment about having a concert hall up high in a tower, or on the ground floor. OK, now I can respond to what barman said. I think a lot of people feel the same way. Of course there is some nostalgia for the bands that have played there, but I don’t think it is anything really special in that regard. It isn’t like the Crocodile Tavern, for example which had lots of grunge bands before the music became internationally popular. Or the Spanish Castle, which inspired a great song. If they opened up a hall right next door, and it had the same size, and similar acoustics, I think it would be fine with everyone. This makes it different than, say, the Paramount, which really is a cool looking old building (or the Spanish Castle, which unfortunately was replaced by a strip mall a long time ago). As for acoustics, I only saw one show there, but wasn’t that impressed. That didn’t really stand out for me. What I liked about it was the general layout — lots of places to dance. There is no reason why this can’t be replicated elsewhere. I think this proposal makes a lot of sense. As mentioned, it should probably be the opposite (concert hall on the first floor). I think that is realistic and would be ideal. But I could also see additional halls built at the Seattle Center, or next to the stadiums. Neither are as centrally located as this, but are not that difficult to get to via transit. The author is in the camp that says Seattle would be a better place if it weren’t for those NIMBYs who saved the market and Pioneer Square from demolition in the freeway era (and stopped the freeways too). If only we’d built dense housing we didn’t need then! This is just about there being different touchstones for nostalgia for different Seattleites, and younger urbanists (the ones who aren’t developers) aren’t used to their ox being gored (or their building being facadomized). I’m 46 and went to plenty of shows at the Showbox in the 90s and 00s. I understand the need for performance venues, but sorry, there is nothing especially notable about the Showbox that warrants historic protection. It’s not a beautiful building nor of artistic note. There will be more performance venues. It won’t be the 90s again if we save the Showbox. There was no housing shortage in that era. The century-old Pioneer Square buildings are denser than newer buildings their size, especially the space-wasting crap that was being built in the 60s and 70s. How would a 42-floor residential building handle daily transfer of 1200 people to and from the top floor? The end of every show would look like the Husky Stadium Light Rail Station when the escalators are out of service. I’d rather see an incentive for the building owners to retain the ground-floor venue in some form. The author obviously wasn’t thinking about those who need to schlep drum kits and other equipment, I’m not even sure if the author has ever attended a live show. A venue on the top floor of a luxury apartment building would be the most hated venue in the country both for artists and those who live in the building. I’m no expert on sound insulation, but one creative idea I heard was to keep the Showbox (not necessarily the same physical space) on the ground floor and and put a day care above it, which serves a vital need during the day and sound insulation at night. Then 40+ floors of residential / office / hotel / whatever above that. That’s a great idea, Steve. Whatever retail and housing requirements are needed by the developer to make the project pencil out financially can be incorporated along with keeping the Showbox on site. Any day uses would work on the second floor (and if it has to be generic retail to satisfy the developer, so be it), but targeting in-city daycare is a nice way to acknowledge that the same building can accommodate multiple uses and that the city is a place for both concert-goers and families with children (groups that are not mutually exclusive). There are plenty of opportunities to take cheap shots at developers and new housing in general. I usually join the side of housing. The Showbox is a different beast and ya’ll really should make an effort to recognize that. Great large club sized concert venues are not easy to create – If you think they are I invite you to compare Showbox Market to Showbox SODO. The Showbox has legitimate historic and cultural value. This isn’t about the building or facade. I’m no engineer, but that lot looks large enough to get creative and build housing AND preserve the Showbox. We need to figure this out though. Far too often the preservation boards are “saving” things like a parking lot in Pioneer Square instead of engaging in the seeious work of identifying what we need to preseeve, in advance, and where that building capacity should go instead. I read this just as speculative nonsense from the post's author, an example of such a cheap shot that you mention in your reply above and easily dismissed. “We don’t need more luxury housing.” But we need the property taxes they produce. The Escala is luxury housing. It generates several million dollars a year in property taxes. So, more luxury housing, please. It helps fund government. It helps fund schools. Finally! Sam and I agree on something: The fastest path to property tax relief is to increase the denominator. How about some appreciation for the free new bus service between Seattle Center and Pioneer Square, along Alaskan Way. Has multiple stops and seems to be under the radar. It’s not part of Metro. Yeah, it could be even more frequent, and serve the Showbox block, if it went to Westlake, and connected to the monorail. Then, we could see if it is as good as a streetcar with dedicated lanes. I’m guessing its ridership is paltry. What free new bus service? Do you have more information, Deborah/Brent? I’d find this potentially quite useful. Looks like its viaduct related, targeted at parking mitigation. But I could definitely use this as well. To get to the Showbox, you would have to take the hillclimb, though. Thank you, Erin! I couldn’t find anything in a fairly cursory search. Personally I’d walk to the Showbox from home or work, but this might be a faster trip to Pioneer Square at times. It doesn’t run frequently (25 min.) but if there happens to be one coming it could be useful. I’ll have to check it out. I don’t see a compelling reason why the city should protect the Showbox. If the owner wants to tear it down and build something new, let them. The thing about solving the next generation’s housing crisis is you still have today’s housing crisis to deal with. Letting luxury buildings get run down isn’t the only way to do affordable housing. I doubt many of the tenements in NYC were built as luxury buildings. Granted, they were not up to what we’d consider livable standards today, but it does illustrate that you can do both *new* and affordable. For example, no-frills 4-plaexs and duplexes, low rise wood frame apartments can work. The current zoning bans make this kind of development near impossible, but IMHO that’s where the energy should be spend. Focusing on old run down complexes that often have health issues as affordable housing is a bit … inhumane? There has got to be a better solution to address *today’s* housing crisis. The real factor here is the vacancy rate. When it’s 10% rents remain steady or fall. When it’s 3% they rise rapidly. When you’re at the edge of a crisis a small change has big effects. There was slack in the market until it dried up completely in 2011, and then older affordable units started getting a huge jump in rents. If we don’t get the vacancy rate back up those new buildings will never become affordable because there’s insufficient supply. The only way to get the vacancy rate back up is to build more units or convince people to move away. It’s a both-and solution. There’s little affordable housing being built in the downtown core because of the high price of land. It’s much more effective to built affordable house elsewhere in the city & region, assuming it’s near good transit to connect the residents to jobs. For this particular parcel, a privately funded 40-story building seems to be the best use for this land. I’m all for more “missing middle,” but that’s not particularly relevant when judging a high-rise project. Bond Package? Since when are they issuing debt on future MOVE Seattle revenue? I couldn’t find any mention of bonding, or even financing, in the text for Res 31830. As far as I know the revenue from the Levy to Move Seattle is not being bonded. The levy expires 6 years from now so it wouldn’t be much of a bond stream. As a Gen Xer, I would prefer that whatever goes there, that low or middle income housing be included (no developer buyout allowed) rather than having a music venue not much different than DC’s 9:30 club or Black Cat. Just out of curiosity, which notable Seattle bands played there? Pearl Jam, Nirvana, etc? The Showbox was born in an era when downtown Seattle, Belltown and Pioneer Square offered plenty of cheap housing for artists and musicians attracted to the bohemian urban lifestyle. There were also several other venues–Gorilla Room, Frontier Room and plenty of sleazy 1st Avenue bars that had band nights to entertain the locals. Obviously, those days are long gone and downtown is full of new buildings, new money and top dollar dining establishments. What purpose does the Showbox serve in the 2018 version of downtown Seattle? So, who really wants to preserve the Showbox? I understand the need to preserve the past, but the downtown arts and music scene of the 1980s and 90s has moved on. And most of the artists and musicians from that era have moved on, too. Keeping the Showbox is like trying to justify an embarrassing tattoo from 1987. It might have made sense 30 years ago, but it makes very little sense today. Also, enough of the “building luxury housing makes other housing cheaper” argument. Seattle has built over 50,000 new housing units since 2010 (while adding ~120,000 people). Rental prices don’t operate in a vacuum. When the most highest rents are rising, all other rents will rise, too. Adding 40 stories of high priced housing in downtown Seattle isn’t going to make Rainier Valley or Lake City a cheaper place to live. Not if they can’t find renters. >> Adding 40 stories of high priced housing in downtown Seattle isn’t going to make Rainier Valley or Lake City a cheaper place to live. Compared to the alternative, it will. Your basic argument is that it is too tiny to matter. That is like saying there is no point in me, personally voting. Yet if everyone that supports my candidate takes that approach, then they will lose. The other argument is that building a bunch of luxury housing won’t reduce costs elsewhere. I disagree. Luxury housing is used by people who can afford it. If it isn’t built there, they will move somewhere else. That, in turn, will increase the cost of that place. That is why there are literally million dollar homes in my neighborhood, even though my neighborhood is crap. OK, maybe not crap, but there aren’t sidewalks, they are no views, there is nothing special in terms of bars, restaurants, or clubs. It also lacks parks. Most of the people move here because they can’t afford to live someplace nicer (some place that has those things). But since they can’t afford that (and they aren’t building more of those places) then they spend a bunch for places that used to be pretty darn cheap. The article doesn’t show the data to back up the headline. Regardless, Seattle has a new MHA ordinance, which will require the developer to fork over $5 million to an affordable housing fund in order to build the 40 stories of market-rate housing. I’m not sure if the NIMBY lawsuits holding off implementation are going to enable the developer to get out of that fee. Seattle is building a lot (but still not enough) income-limited housing. I don’t know how it compares to what other cities are doing, but like our mostly ROW-separated light rail, we may be building the good stuff other cities are not. And as the article points out, NIMBYism has made it hard to build any new housing, market-rate or income-limited, pretty much everywhere. NIMBYism seems to be causing mass homelessness. That’s not an invariable law of physics. It just describes the level of investment we’ve made so far. And that we’re at a curious and unusual point, where the trend for upper middle-income and lower-income apartments are going in opposite directions. Also, this is a nationwide average, so the Seattle market will be significantly different. This is probably what it is. There’s a temporary glut of high-end housing, which will be absorbed in a year or two as the population increases. Normally this wouldn’t even be worth mentioning, but the Washington Post picked up on it imaging a larger trend. But there’s still no sign of a recession, so why should demand for high-end housing drop significantly or sustainably? The John Foxes of the world believe that the presence of high-end housing drives up rents in low-end housing, independent of the vacancy rate, but that’s just flat-out false. The price of cars or food don’t behave like that, so why should housing be the only thing in capitalism that does? It’s true that there’s a very minor effect: some landlords see a new building and use it as an excuse (“the neighborhood is getting better”), but they can’t do it very much or very long or they’ll end up with an empty unit nobody will rent because they can get a better deal elsewhere. So the problem of housing is like the problem of poverty. The reason we have expensive housing and poor people is not that building more housing or welfare doesn’t work, it’s that we’ve failed to do enough of it to make a quantum leap of difference, and we’ve let it fall behind the population increase and inequality increase. If there literally was a regional shortage in high end rentals, I could see people who wanted to rent a high end apartment being forced to settle for a no frills place in the valley or Lake City instead. However, there is currently a *glut* of high end housing. More likely than not, even if Seattle lacked high end rentals, those guys would rather find a place in Bellevue, or even a house, rather than rent an apartment in the valley. Or just not move to the area in the first place, if it doesn’t offer the lifestyle they want. While the real estate market as a whole will always do its thing (attracting more wealthy people means it is a desirable place to live, hence property values will go up), I just don’t believe there is that much direct competition from those wanting to rent in a high rise with amenities vs. those who just want cheap rent. Similarly, those looking to buy in the $800K price range aren’t going to be looking at $300K houses. His point is essentially that the people in Rainier Valley and Lake City won’t be able to afford it. Or as I put it, there are different housing markets at different price points, and they’re only partly related. And while a $5 million mansion on Lake Washington probably has nothing to do with the non-tycoon market, the gap downtown is not so large. People with six-figure salaries will fill it, and that means they won’t be competing in other neighborhoods. They may not want a run-down old apartment in LC or RV, but they may take one of the new apartments there if they can’t find anything downtown. One building and ten renters won’t make a difference, but it’s not one building in a vacuum, it’s the entire market. Or as my high-school chemistry professor said, chemical formulas don’t deal with single atoms but with moles of atoms (6 x 10 ^ 23). While that building is being built, others are being built, at different price points, and a certain number of people are looking for units. It’s the combination that determines whether rents can rise and how much. We’ve consistently underextimated and underbuilt. At this point we can throw any building at the problem because it’s that bad (although maybe that $5 million mansion on the lake is still irrelevant). If we go too far and overbuild, well, that would be a nice problem to have for a change, and the developers will stop building within a year or two of it. Have to be careful that “preservation” doesn’t come to mean “taxidermy.” I’d rather have a forest preserve with ongoing generations of live animals that I can’t personally see, than a stately old nearby lodge with their ancestors’ heads on plaques over the mantelpiece. So I wonder if the first memorable performers at The Showbox wouldn’t rather repurpose today’s urge to preserve buildings, to building whole new artistic communities- each within easy walk to a Link station. Including one in the basements of more than one such venue. And since so much of the energy behind yesterday’s musical dynamite came from a working class background, it might be even more important that venues be close as possible to homes that are an easy walk from work well enough paid that he audience can afford to live in the neighborhood. Tin Pan Alley didn’t have much High Quality cookware within earshot of clarinets or saxophones. To me, main reason to think of Sound Transit’s service area as a region is to create space and participation for future activity itself. Not fights over buildings, however beautiful, in a limited number of places now too confined to give birth to anything expansive. From Jackson Browne….just a suggestion on outlook. How about we call it the Showbox Apartments and keep the neon sign? Rite Aid on Broadway managed to reuse a marquee. They did, but damn that’s an ugly building now. The marquee has no contextual connection with what they did to the rest of the place. I am a huge fan of the Seattle Transit Blog, but always am mildly sadden by the strong will to tear down buildings with the blanket defense that it’s for housing. I am on board with whatever we can do to keep and produce more housing in Seattle, but I think some discretion is warranted, particularly towards the Showbox. Perhaps I say this because I am an architect and music fan and while the venue appears to be run down, the bones of the building are truly treasures from 1939 and the venue is one of the best in town for concerts. I think there is value in keeping a cultural institution which adds to the reasons why people like living here. I take some offense to throwing historic preservationist in this bucket of anti-housing advocates. I know there are some questionable defenses from historic preservationist, but they do serve a valuable role in keeping a few thing of the past around (like Ballard Avenue) that many people enjoy every day. In regards to what was specifically written, placing a NEW concert venue in the new building defeats the point of why the Showbox should exist. The ideal solution would be to find a way to build above the showbox and restore the existing venue. I would advocate for the city allowing whatever the developer wants to make that trade-off (raise the height limit so revenue would offset the cost on the developer) if it’s even feasible structurally. Technically speaking, and I know some people have commented, but placing a concert venue on the top floor of a tall building would have issues from an egress requirement. A concert venue requires a lot of space for exiting or egress a building. A lot of floor area would be eaten up to provide the stairs and width of corridors to get people from the venue to the ground floor. This is why we see concert venues on the lower floors, in addition to other technical matters.